Newcastle is one of the UK’s most vibrant cities, known for its colourful nightlife, culture and charming locals. Whether you’re attracted by the nearby sights and sounds, or the taste of urban sophistication, the Newcastle Quayside area is the perfect place to base yourself when you stay in the city. Right in the heart of the action on the southern bank of the River Tyne, Jurys Inn Newcastle Quayside is just a few steps from the Gateshead Millennium Bridge. However you plan to spend your time, you’ll have the perfect base to explore this North East gem. If you’re going for the culture, our Quayside hotel is just a stone’s throw from the award-winning BALTIC Centre for Contemporary Art which exhibits artists, photographers and designers from around the world. Sage Gateshead is only 100 metres along the riverfront, a stunning musical venue that also puts on classes, courses and workshops – it’s a worthy feature on your itinerary. Whether you love to seek out quirky handicrafts, unique jewellery or fresh produce, the Newcastle Quayside Market is brimming with independent traders offering great buys. Open every Sunday from 9am to 4pm, the wonderful setting by the Millennium Bridge is complemented by an array of artists, designers, jewellers, food producers, photographers and ceramic artists, with street artists and buskers providing the entertainment. Howay man, what’s that place? Who doesn’t love a Geordie, right? Easily recognisable by its bright orange door, UpSide Down Presents is a real tourist hotspot. It has a huge array of gifts and presents that specialise in a Geordie theme, from magnets, mugs and other souvenirs to dialect translators and greeting cards for your Mam. 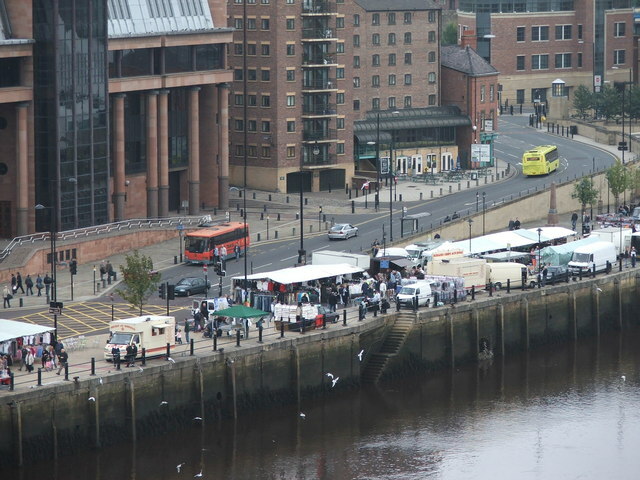 Be beside the seaside at the Quayside every year between spring and autumn. Whether you’re building sandcastles with your little ones or putting your feet up on a deckchair and soaking up a few northern rays, Quayside Seaside has great views of the river and Millennium Bridge. As well as a slide, fireman’s pole and beach huts, there are also special events and you can grab a bite at the Little Fishy pop-up fish and chip restaurant. If you’re after a bigger meal, pull up a chair at our hotel’s riverside restaurant and take in the views out across the Tyne - there’s even an outdoor seating area for a spot of al fresco dining. The Quayside’s well known for its eateries, including Italian options like Gusto, Babucho and Sabbatini’s, or East Asian offerings such as Orchid, Mantra Thai and River Beat. Try the Bridge Tavern for locally sourced beef or pulled pork burgers, or Redhouse where you can sip a pint of craft beer while you wait for a traditional handmade pie. Although there’s lots to keep you busy on the Quayside, there’s plenty to see in the surrounding area too. Cross the river to see landmarks like Newcastle Castle, catch a show at the O2 Academy or head to the intu Metrocentre for some retail therapy. Take a boat tour with River Escapes, or visit the iconic Angel of the North, just a 20-minute drive south of the city. If you can surf, the beaches of Tynemouth are an absolute must, but anyone can enjoy the sands on a sunny day. You’re going to have a great time in Newcastle. To make sure you’re well looked after and comfortable at the end of your action-packed days, book your stay at Jurys Inn Newcastle Quayside.